This ground-breaking guide, authored by Nils Navarro, extraordinarily talented wildlife artist, illustrator and scientist, was over ten years in the making. It promises to set a new standard for field guides. 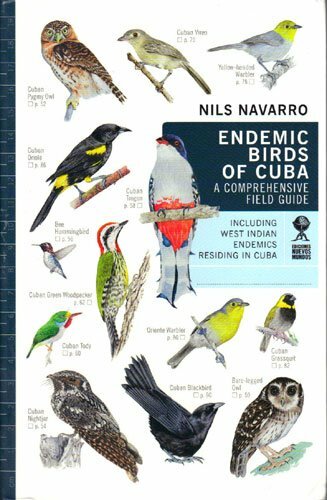 This is the first field guide focused on Cuban endemic birds. The book is worth owning for the artwork alone. Each bird comes to life on the page, thanks to Nils’ intimate knowledge of each species from countless hours of careful observation in the field. Species accounts include concise notes on identification, status, distribution, habitats, behavior, and food. The accounts are supplemented with easy-to-read distribution maps and symbols (that can be colored in) that provide a quick reference to key information. Silhouettes and illustrations of each bird in various typical postures provide helpful cues for identification, especially in conditions of poor visibility. Blank space on each page allows the user to write personal field notes. Also included in the book are illustrations and accounts of 22 West Indian endemics that live in Cuba, information and photographs on the different habitat types found in Cuba, and photographs of each endemic species in its typical habitat. Whether you plan to travel to Cuba for the first time or have been there already, the introductory chapter on Cuba is a must-read. Handy tips on how to move around Cuba, essential birding sites, and which plants to avoid in the field are very helpful. Known as the “Queen of the Caribbean,” Cuba’s rich biodiversity and endemism are described as well as threats to its bird life, conservation status of threatened birds, efforts to conserve them, and environmental laws in Cuba. There’s even a section highlighting the fact some of the smallest animals on earth are in Cuba-from scorpions, bats and frogs to the Bee Hummingbird.